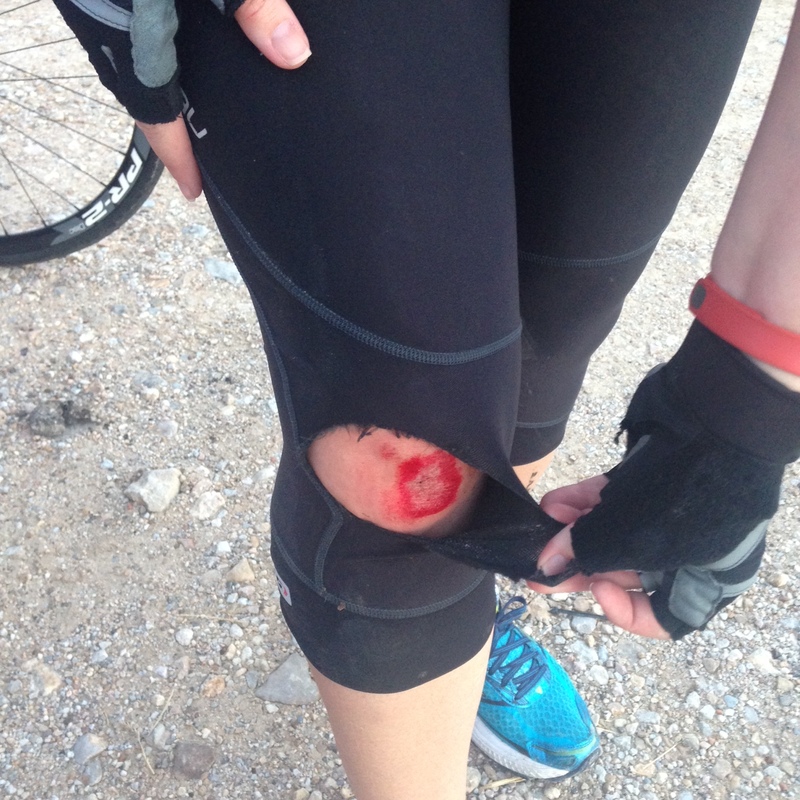 About six weeks ago, I took a nasty spill on my bike—well, two spills actually. It was my first time out at the Marine Creek trails, and the ground was still slick from storms the day before. It had been so long since I had been in a bike wreck that I had completely forgotten what it felt like to hit the pavement. I grew up riding bikes (cheap things with pink tassels and baskets not gears). 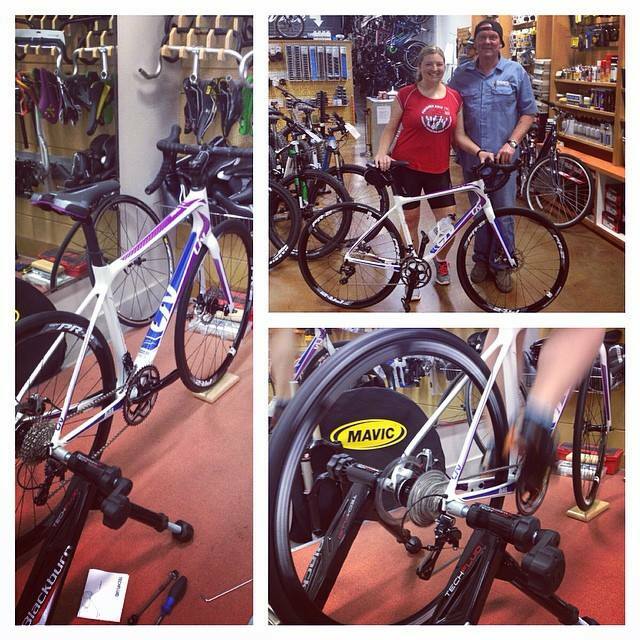 I am still a road bike newbie and more than a little trepidacious. My husband was riding behind me when I hit a slick puddle and went sliding sideways down the trail. It happened so fast, I didn’t even know what happened. It happened so fast, he didn’t have time to stop himself from following my lead and hitting the ground. Sure enough, I look down to find my bike shorts torn and my right knee bleeding, plus both elbows scuffed and bleeding as well. But I didn’t feel that bad, and my bike appeared to be in okay shape except for a few scrapes, so we agreed to keep riding—more cautiously, of course….And not cautiously enough. After hitting another slick spot and meeting asphalt again, we decided to call it a day. By the time we loaded the bikes up, the pain started to set in. My legs began to stiffen, a large purple welt was growing on my left knee, and my open scrapes stung as we poured bottle water on them to clean out the dirt and gravel. Later, I took one of the most uncomfortable showers in recent memory. Sitting on the couch afterward, with wounds dressed and ice applied, I thought to myself, well, this will interrupt my workout schedule for a day or so. The next day, after a restless night’s sleep and now with the mobility of a 90-year-old woman, I had to admit that I may have been a little overly optimistic with my initial assessment. It turns out, when you have trouble navigating a morning pee, you may not be ready for a 20-mile cycle ride the next day. The first week, I tried to be patient with the process, Googling bandaging techniques, icing and elevating and applying antibiotics. I did my best to stay mobile and put on a good face—be proactive. But as the process dragged on, for two weeks then three, I became more agitated. How long was this going to take? It struck me in the moment how interesting wounds are. When I think about my fear of being in a bike wreck, I am most scared about the moment of impact. But in the moment I had my accident, I actually didn’t feel that much pain. The worst of the discomfort came later, and my biggest frustration wasn’t the pain at all—it was the impatience with the healing process. I wanted to be back to normal. I wanted to go back to doing what I was doing before. And it wasn’t happening fast enough. It was happening on its own schedule independent of my opinions about it. I think that emotional wounds aren’t much different. The moment when the relationship or job ends or you suffer some greater loss is the moment you may fear the most, but the worst of the pain doesn’t happen at the moment of impact. It actually comes much later. And when you feel broken and limited, you just want to be healthy again as soon as possible. But wounds heal on their own schedule. Having patience with yourself in those moments can be hard. I may have been frustrated with how slowly my legs were healing, but at least I could check the progress every day. Today, six weeks later, I can look down at my knee and see the angry red outline where the scab once was. I can feel the tenderness of my shin where the bruise still is even though the purple color is gone. With emotional wounds, it’s not so easy to tell where we are in the healing process. And some days we may wake up and think, it doesn’t hurt today, I must be better. Then a few days later, something sends of reeling, and we have to acknowledge that we are not as far along as we hoped in the process. That can be demoralizing. One of the most difficult things for me to understand is how some wounds feel serious but then are gone before you know it, while others that “shouldn’t” be a big deal can take way longer to heal than expected. I have a running joke going that I can’t be in the kitchen for more than an hour without burning myself. And I had some serious burns through the years, but for whatever reason, most of them don’t bother me much. Last night, I got a small grease burn while frying up some empanadas, and for a few hours afterward, I could feel the nagging burn on my finger from the spot where the oil hit skin. But today, I feel nothing. I see the raised blister, but I am back to normal. I am tough, I tell myself proudly. I have burned myself enough to be immune to a little grease popping. Or am I? I took a risk and left freelancing for a corporate job late last year. And I was laid off from said job four months later. I hated the job. I hated the toxic environment I worked in and regretted my decision to take the job almost instantly. But the pain of that failure still smarts—of those “should” and “shouldn’ts” that if only I had done, I wouldn’t feel this way…I just want to feel normal again. I think in those moments when the pain of a wound drags on, that is when I am most hard on myself…for not being stronger, for not just willing myself to be better. Shouldn’t we be able to tell ourselves to get over it and that’s that? If we were tough enough, we could just get over it. The rejection letter doesn’t hurt. Being passed over for a job or promotion doesn’t hurt. The divorce shouldn’t hurt “any more.” The long-time friend who left you hanging, it’s okay—You’re tough. You’ve been through this before. You’ve had long enough to recover. But you look down at the scab on your knee (or some other nameless place) and it’s opened up again. And life still isn’t normal. How long before it stops? It’s just gonna take as long as it takes. Very wise words. I’m always trying to up my pace of healing, too. yeah.